Rupert Thorne’s goons confront Commissioner Gordon at his home, telling him they know “Joe Brody” was really an undercover cop. They demand any info the cop acquired in exchange for his life. Gordon chases them away, stalling for time. He knows he has 24 hours to find and save officer Anton Miller. Gordon asks Batman to shadow Thorne while Gordon tracks down Miller. Gordon squeezes the information out of a club owner, and then heads to the warehouse where Miller is held. The rescue is cut short when he’s attacked from behind, and he finds himself and Miller bound and delivered to Rupert Thorne, who has been entertaining an out of town business associate from Detroit. Before Throne can shoot Gordon, the guest attacks. It’s Batman in disguise! 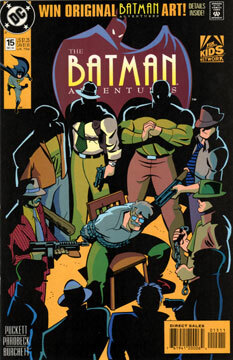 Batman takes out the goons, while Gordon confronts and outsmarts Thorne. Miller is saved and Thorne is carted of to jail. After last issue, we’re back to a high quality tale, though it is short and sweet. As much as I like Batman, I think some of the best stories are those in which he takes a secondary role. Shining the spotlight on Gordon is a welcome change of pace. And keeping the whole thing set in the world of cops and mafia is also refreshing. No Arkham inmates here!